Posted March 11th, 2009 at 10:59 am. Mathematics major Jackie Lang ’09 is one of just 14 American students who have been chosen to spend next year at the University of Cambridge as Churchill Scholars. The scholarships, awarded annually by the Winston Churchill Foundation, fund tuition and fees as well as living and travel expenses. Selection criteria include exceptional academic achievement; a capacity to contribute to the advancement of knowledge in the sciences, engineering, or mathematics by pursuing original, creative work at an advanced level; and outstanding personal qualities. 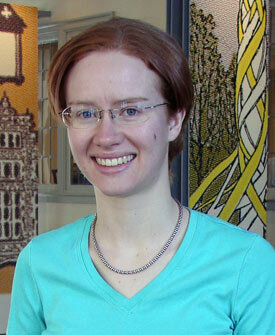 Lang, who plans to graduate from Bryn Mawr this May with both A.B. and M.A. degrees through the College’s Combined A.B./M.A. Program, intends to enter a Ph.D. program in mathematics after her year in Cambridge, where she will earn a Certificate of Advanced Study in Mathematics. According to Professor of Mathematics Helen Grundman, who is Lang’s thesis adviser, the Longmont, Colo., native has already started down the path of advancing knowledge in mathematics. Last summer, a National Science Foundation research internship at Williams College led to “a very impressive result that she and her collaborators will be publishing in a mathematics research journal,” Grundman reports. Lang doesn’t spend all of her time hitting the books. A violist, she has played with the Haverford-Bryn Mawr Orchestra and a few student chamber-music groups. As the mathematics representative to the SGA Majors’ Council, she has spent a good deal of time arranging department parties and events; she has also served as a student teaching assistant, mentoring less-advanced students in math classes, and as the co-coordinator of the Distressing Math Collective, a Bi-College student group.